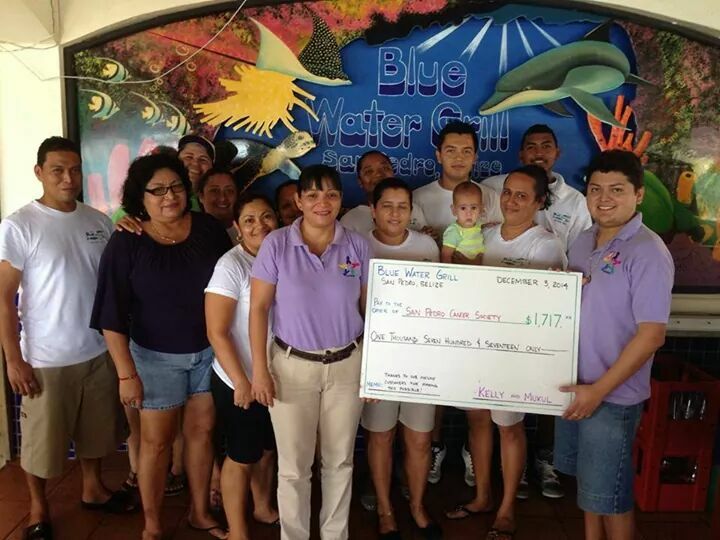 San Pedro Cancer Society (SPCS) was the recipient of a check of $1,717BZ from Blue Water Grill (BWG). The donation was presented on Wednesday, December 3rd and was part of a social media incentive to raise awareness for SPCS. The well-known island restaurant posted on their popular Facebook media page that they would donate $1BZ for every ‘like’ that their image of Giving Tuesday received during a set time. At the end of the allotted time (midnight), the image had received an astounding 1,717 likes. SPCS members happily accepted the check and were very grateful to be the recipients of such a generous donation. The non-profit organization has been aiding island cancer patients since 2010, and rely on monetary donations and fundraising events to raise money to complete their missions. “We thank them and you all for always spreading our news and keeping our cause so close to your hearts. Thanks a bunch to BWG! It would be a hundred times harder without your help and support. 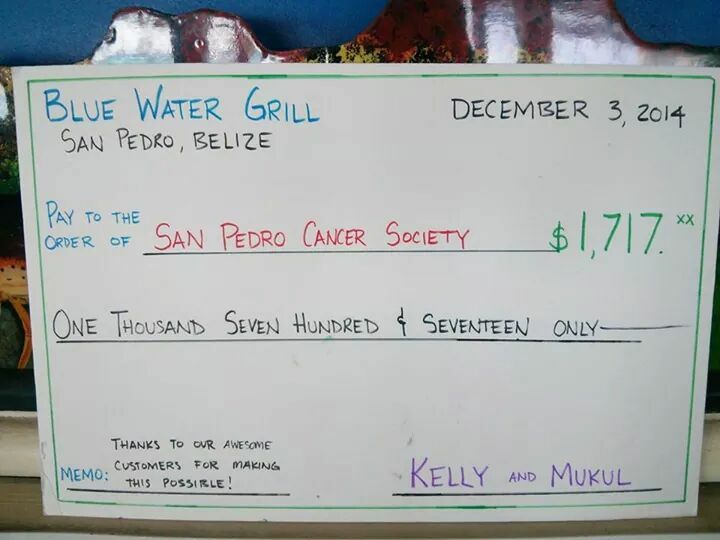 Since we began helping the people of the San Pedro community as the San Pedro Cancer Society, Blue Water Grill has been at our side both assisting and motivating us to move forward. We thank them very much on behalf of our members and patients!” said Miguel Perez, President of SPCS. “Thanks a million to all of you for helping us in our fight against cancer. And thank you also for your business, because we know that none of this giving would be possible without you all eating and drinking at BWG,” posted BWG on their Facebook page. “Last, we thank you for giving us an opportunity to make one of those giant checks like they give to lottery winners!” Generous and funny!